My grandfather was an amazing man. He would make you laugh when you were in the worst mood, then turn around and cuss at you all in the same breath. He worked as a carpenter his entire life and he always had a wealth of knowledge to share. That knowledge transfer would usually start by him saying, “No seas pendejo! Mira hazlo asi”, loosely translated into English, “Don’t be stupid! Look, do it like this”. He grew up in a culture and era where power tools were a luxury that he couldn’t afford, but looking back at some of the things he accomplished with just hand tools, is amazing. He had a mastery of Geometry, angles and mathematics that would rival most of today’s college students, but he dropped out of junior high school. So this knowledge wasn’t something he learned via a formal education. It was shared with him by other fellow makers throughout his working life. 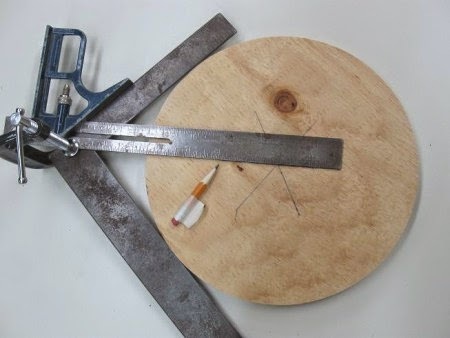 You could give him a circle of any size and using an L-square and a Combination square he would find the exact center of that circle with a few pencil marks. No mathematics involved! In my grandfathers words, “Geometry is for people who have time to think about those kinds of things. All the math is in the tools, you just need to know how to use them correctly to get things done.” Here’s another example. Those shiny hand saws you see at the store, if you thought they were good just for cutting, my grandfather would have a name or two to call you. Flip them over with the teeth pointing away from the cutting piece and they become an instant square. 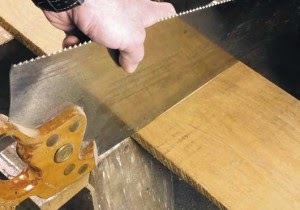 Use the reflection of the saw against the wood and when the lines of your cutting piece are straight with the reflection you have a square line across your cutting surface. What if you wanted to cut a 45 degree angle? 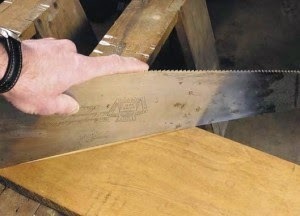 Angle your saw until the reflection you see is perpendicular and you have your 45 degree angled cut line. Seeing these techniques being applied when I was young seemed like magic. Even though I didn’t know any better at the time, my grandfather was teaching me the principles of mathematics as young as 6 years old. This is what being a maker is all about, learning by doing. I could read a hundred books on the subject of woodworking but never know these shortcuts existed if it wasn’t for my grandfather teaching me, via hands on learning, what he had picked up throughout his life. A makerspace thrives on building a community where you can teach others your experiences and learn something new from their experiences in the process. In my grandfathers words, “Everyone you encounter throughout life will have unique and valuable lessons to share depending on their professional background, knowledge and upbringing. You just have to be willing and open to learn.” What experiences or lessons would you be able to en-part on your fellow makers? Next → Next post: Why Should I Become a Member of a Makerspace?